Astronaut Walter M. “Wally” Schirra, one of the original seven astronauts for Mercury Project selected by NASA on April 27, 1959. The MA-8 (Mercury-Atlas) mission with Sigma 7 spacecraft was the third manned orbital flight by the United States, and made the six orbits in 9-1/4 hours. PERSONAL DATA: Born March 12, 1923, in Hackensack, New Jersey. Died on May 2, 2007. Survivors include his wife, daughter and son. EDUCATION: Newark College of Engineering (N.J.I.T. ), 1941; U.S. Naval Academy, 1942-1945 B.S. ; Safety Officers School (U.S.C. ), 1957; U.S. Navy Test Pilot School (N.A.T.C.) 1958; NASA Astronaut Training, 1959-1969; Honorary Doctorate in Astronautical Engineering, Lafayette College, 1969; Honorary Doctorate in Science, U.S.C., 1969; Honorary Doctorate in Astronautics, N.J.I.T., 1969; Trustee, Detroit Institute of Technology, 1969-1976; Advisor, Colorado State University, 1977-1982; Trustee, National College, South Dakota, 1983-1987. AWARDS: The Collier Trophy, 1962; Kincheloe Award, SETP, 1963; Haley Astronautics Award - AIAA, 1963, 1969; Harmon International Trophy, 1965. AWARDS-MILITARY: U.S. Navy Distinguished Service Medal; Distinguished Flying Cross (3); Air Medal (3); NASA Distinguished Service Medal (2); NASA Exceptional Service Medal (1); Philippines Legion of Honor (Commander). HALLS OF FAME INDUCTED: International Aviation Hall of Fame, San Diego, CA, 1970; New Jersey Aviation Hall of Fame, Teterboro, NJ, 1977 (approx. ); International Space Hall of Fame, Alamagordo, NM, 1981; National Aviation Hall of Fame, Dayton, OH, 1986. NASA EXPERIENCE: Captain Schirra was one of the seven Mercury Astronauts named by NASA in April 1959. On October 3, 1962; he piloted the six orbit Sigma 7 Mercury flight; a flight which lasted 9 hours, 15 minutes. The spacecraft attained a velocity of 17,557 miles per hour at an altitude of 175 statute miles and traveled almost 144,000 statute miles before re-entry into the earth's atmosphere. Recovery of the Sigma 7 spacecraft occurred in the Pacific Ocean about 275 miles northeast of Midway Island. Schirra next served as backup command pilot for the Gemini III Mission and on December 15-16, occupied the Command Pilot seat on the history-making Gemini 6 flight. The highlight of this mission was a successful rendezvous of Gemini 6 with the already orbiting Gemini 7 spacecraft, thus, accomplishing the first rendezvous of two manned maneuverable spacecraft and establishing another space first for the United States. Known as a "text book" pilot, Schirra remained in the spacecraft following his Mercury and Gemini flight and is the first Astronaut to be brought aboard recovery ships twice in this manner. 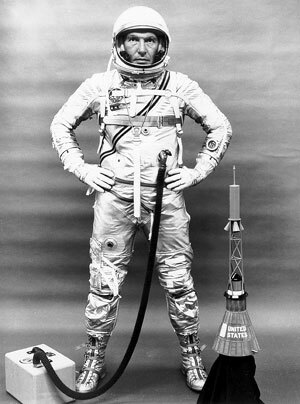 With him on Gemini 6, was Astronaut Thomas P. Stafford. He was the Command Pilot on Apollo VII, the first manned flight test of the three direction United States spacecraft. Apollo VII began on October 11, 1968, with Command Module Pilot Donn F. Eisele and Lunar Module Pilot Walter Cunningham. Schirra participated in, and executed, maneuvers enabling crew members to perform exercises in transposition and docking and orbit rendezvous with the S-IVB stage from the Saturn IB launch vehicle. The mission completed eight successful tests and maneuvering ignitions of the service module propulsion engine, measured the accuracy of performance of all spacecraft systems, and provided the first effective television transmission of on-board crew activities. Apollo VII was placed in an orbit with an apogee of 153.5 nautical miles and a perigee of 122.6 nautical miles. The 260 hour 4.5 million mile shake down flight was concluded on October 22, with splashdown occurring in the Atlantic some 8 miles from the carrier Essex (only 3/10 of a mile from the originally predicted aiming point). Captain Schirra has logged a total of 295 hours and 15 minutes in space. He is unique in that he is the only Astronaut to have flown Mercury, Gemini, and Apollo. BUSINESS EXPERIENCE: Director, Imperial American (Oil & Gas), 1967, 68, 69; President, Regency Investors (Leasing), 1969-1970; Founder, Environmental Control Co. (ECCO), 1970-1973; Director, J.D. Jewel (Chicken Comp.) 1971, 72, 73; Director, First National Bank, Englewood, Co., 1971-1978; Belgian Consulate for Colorado and New Mexico, 1971-1984; Director, V.P., Chairman, Sernco, 1973-1974; Director, Rocky Mountain Airlines, 1973-1984; Director, Carlsberg Oil & Gas, 1974, 1975; V. P., Johns-Manville Sales Corp., Denver, Co, 1975, 76, 77; Director, Advertising Unlimited, Sleepy Eye, MN, 1978-87; Director, Electromedics, Denver, Co, 1979-1985; President, Prometheus Systems, Inc., 1980-1981; Director, Finalco (Leasing Co.), McLean, Va, 1983-1988; Director, Cherokee Data Systems, Boulder, Co, 1984-1986; Director, Net Air Int., Van Nuys, Ca, 1982-1989; Director, Kimberly-Clark, Neenah, Wi, 1983-1991; Independent Consultant, Schirra Enterprises, 1979-2007; Director, Zero Plus Telecommunications, Inc., Campbell, Ca, 1986-2007. CIVIC ACTIVITIES: Advisory Committee, Oceans Foundations, San Diego, Ca, 1985-2007; Advisory Board/Council, U.S. National Parks (Interior), 1973-1985; Director, Denver Organizing Committee for 1976 Olympics, 1973-1975; Advisor, Flight for Life, Mercy Hospital, Denver, Co, 1978-1986; Trustee, Colorado Outward Bound School (COB), 1970-1974; COB Regional Trustee, 1988-2007; Advisory Board, International "Up With People", 1976-2007; Founder/Director, Mercury Seven Foundation, 1982-2007; Director, San Diego Aerospace Museum, 1984-2007; Trustee, Scripps Aquarium, 1985-2007; International Council, The Salk Institute, La Jolla, Ca, 1989-2007; Sharps Hospital, Foundations Board, San Diego, Ca, 1988-2007. PUBLICATIONS: We Seven, 1960; Schirra's Space, 1988.